6 Feedbacks on "Trump’s Wrong on This One"
Yeah, but if you drink Corona instead of, say, Samuel Adams ou even Coors, then you deserve it. If tariffs produced economic benefits, then it would follow that Oregonians would be better off if they could* enact tariffs on goods made in California so that Oregon wine and cheese producers didn’t have to face less expensive competition to the South. Wouldn’t they? *Once again the Constitution stands in the way of mad populist impulses. n March 2002, President George W. Bush imposed a 30% tariff on Chinese steel. The results were chaotic. In a report put out by Consuming Industries Trade Action Coalition in February of that year, the coalition found the tariffs against China boosted the overall prices of steel and cost the U.S. 200,000 jobs in businesses that buy steel, representing $4 billion. In September 2009, President Obama imposed a three-year tariff on car tires from China. Chinese imports went down, but the tires were simply sourced from other countries, the LA Times noted. According to the Peterson Institute for International Economics, 1,200 tire jobs were saved in the U.S., but through costs passed along to American consumers, 2,500 jobs were lost indirectly. And they ridicule socialists for stubbornly trying over and over to make it work! Corona, a thin tasteless (almost) Mexican export (I presume) not worth drinking IMHO, while, on the other hand, Bohemia in bottles in Mexico is wonderful but not so much when tasted in the USA as an export. Why? 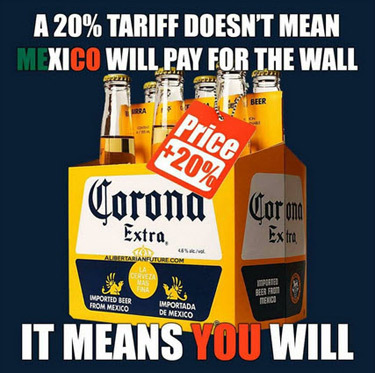 Is Mexico sending the USA their bad beer? An over simplification. If there is no tariff YOU pay for that too with fewer jobs, higher social costs to the government and drug use and crime. Which is worse? 20% more for beer or million on welfare using drugs and committing crimes to buy drugs? A second way we pay for it is because of the burden of illegal aliens. A dozen or more hospitals in Southern California went bankrupt and closed up due to the cost of treating non-paying illegal aliens A million or so illegal are supported in jails throughout the country. Another 6-10 million are receiving welfare. Then there is the cost of unemployment because illegal aliens take jobs away from citizens. The cost of illegal aliens is in the hundreds of billions every year. Then there is the crime. Illegal aliens kill as many Americans every year a died in the Iraq war. The commit tens of thousands of rapes, hundreds of thousands of property crimes. hundreds of thousands of assaults every year. The wall will be cheap by comparison. Last I knew, InBev/AB owns and brews Corona. But Tequila and other things will be more expensive for sure.